Peer Query giveaway for today: 40 Steem more to give away! As at now. We don't yet have any participants. However, @ChrisAiki receives 5 Steem for his 2 million trees by 2020 project. Everyday 10 projects will be curated and the creators will receive 1 Steem each as tokens of participation. Why should I use Peer Query? While still in the early beta. We already have a wonderful product for project listing, custom query and reporting. Lots of improvement are on the way. 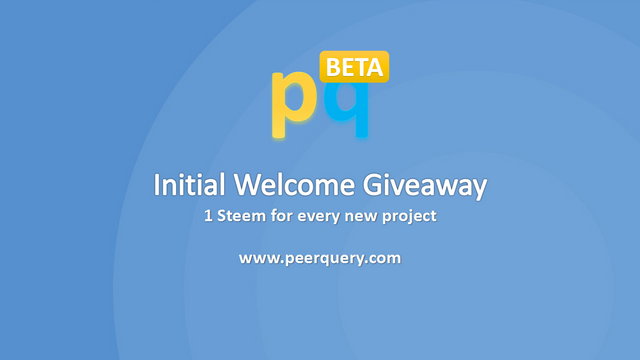 Read more about the contents here: Peer Query: 40 Steem Giveaway to early adopters. Published on Peer Query - Blockchain-powered p2p collaboration. I really recommend PeerQuery , a collaborative website that will empower all the community and help us to build more projects. I see, you want to plant trees huh? Yes, I do, don't you ?